The Tone Job is a complete tone enhancement tool designed around a stereo preamp to cover as much frequency range as possible. What does this mean for you, the user? It means it can handle a wide variety of frequencies from electrical guitars, bass guitar, synthesizer machines and just about anything else you can plug in. The treble, bass and middle controls will cut or boost up to 20db. In addition to that, the level control will boost the signal (post EQ) up to 5 times the input depending on where the dial is set. 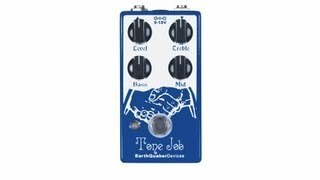 A simple, perfect pedal to place at the end of your effect chain to boost output and fine tune your tone or at the front of the chain to alter the character of your guitar and breath new life into tired old dirt. Analog, true bypass and hand made one at a time in good old Akron Ohio. A standard 9-18 volt DC power supply with a negative center 2.1mm barrel or 9v battery. We HIGHLY recommend investing in a good isolated power supply made for musical instrument applications.